A video, tagged as the Ramgen Revilla and Janelle Manahan Scandal, circulated in the internet particularly on Facebook. They were in the bathroom doing it. The said video was deleted around 10:30pm on Thursday, December 29, 2011. Either the uploader deleted it or Facebook took it down due to its contents. For sure, copies of the video have made it to people's usb drive's, sd cards, hard drives and to several websites. Who could have uploaded such video? A lot of people in forums and blogs speculate that a person close to Ramgen Revilla did it. Some say this video is being used against Janelle Manahan to prevent her from testifying. 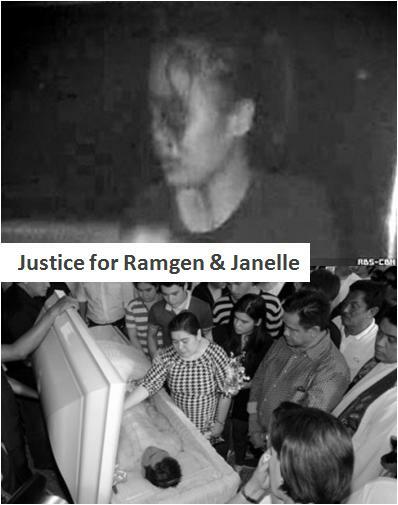 Ramgen Revilla was brutally murdered last October 28, 2011 while his girlfriend, Janelle Manahan, survived the attack after she was shot twice. Ramona Bautista, the only other eyewitness and a suspect and allegedly one of the masterminds in connection with the murder of Ramgen Revilla and frustrated murder of Janelle Manahan, fled to Turkey and is now at-large. Galit? Naghahanap ng video di nakita? Parang tanga lang yong dalawa... pavideo video habang kumakantut.. tas mag rereklamo pag nabuko... naku!!! deserving silang dalawa sa kahihiyan... IMHO..
BAKIT? KUNG DI NILA VINIDEO KANTUTAN NILA.. MASISILIP BA? SAGOT!! !